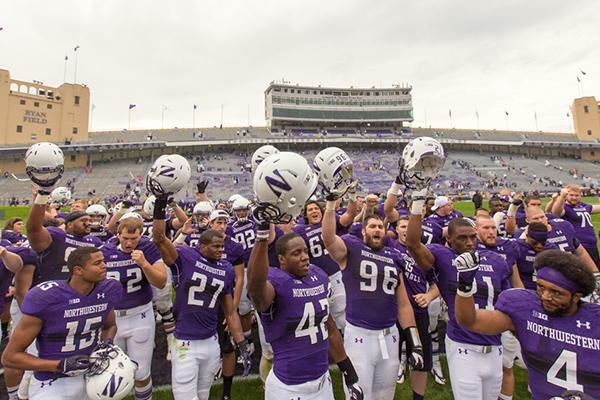 Northwestern players face fans and celebrate after the team's 24-7 victory over Western Illinois. The win provided some relief for the Wildcats, who had lost their first two games before Saturday. Northwestern is finally in the win column. After a difficult first two weeks of the season, the Wildcats (1-2) rode a strong ground game and a bend-but-don’t-break defense to a 24-7 victory over FCS opponent Western Illinois (2-2). The day belonged to true freshman running backs Justin Jackson and Solomon Vault, who dazzled new students and old fans alike by combining to score all three of NU’s touchdowns. Jackson was the workhorse of the offense, taking 21 carries for 92 yards and a score. Vault, meanwhile, had a more limited role but made the most of his six touches by finding the end zone twice. But beyond the rushing attack, it wasn’t a particularly great game for the Cats. Senior quarterback Trevor Siemian was a check-down machine, throwing 25 passes for just 117 yards (a dismal 4.7 yards per attempt) and no touchdowns. Fitzgerald leveled some blame on the receiving corps. Siemian didn’t have to do much with Jackson and Vault in the backfield but struggled to find his receivers downfield and also committed a costly fumble inside the red zone. On that series, NU started with the ball on the Western Illinois 4-yard line thanks to a punt block by another freshman, Keith Watkins II. Highlighting the Cats’ recent struggles with short-yardage situations, the offense failed to punch it in on two running plays before Siemian dropped back and lost the ball. NU’s play calling was more aggressive than in past weeks, including a pair of fourth down attempts and an effective jet sweep wrinkle for junior wide receiver Miles Shuler, but the Cats were outgained on the day by the Leathernecks, 376-283. It was a strange day for the defense, which managed to hold Western Illinois to just one touchdown despite giving up so many yards. Sophomore defensive end Ifeadi Odenigbo was the standout performer, recording two sacks and three forced fumbles as a pass rush specialist off the bench. “I feel like the coaches put me in more and I was able to take advantage of it,” Odenigbo said of his breakout play. Behind him, the secondary continued to struggle. Cornerbacks sophomore Matthew Harris and junior Nick VanHoose were continually picked on, allowing Leathernecks quarterback Trenton Norvell to rack up 293 yards through the air. Making matters worse, star safety senior Ibraheim Campbell left the game in the second quarter with a lower body injury and did not return. The defense was helped by another great day from junior punter Chris Gradone. After a rough game against Cal, he had a bounceback game against Northern Illinois and continued that trend against Western Illinois, booting seven punts for an average of 44 yards, including one that rolled out of bounds inside the one-yard line. It was a win, but not a very convincing one against a lowly opponent. NU and its questionable pass defense will face a stiff test on the road next week against Penn State quarterback Christian Hackenberg. Bolstered by the victory, Fitzgerald was undeterred going forward.